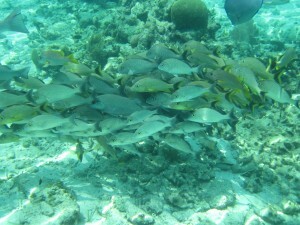 At the time, The Belize Fisheries Department on behalf of the Government of Belize charged the five for illegally fishing within a marine reserve (which went against the Belize Marine Reserve and Protected Areas Act of the Laws of Belize.) Around the time of the incident, Hol Chan Marine Reserve Ranger had set up a sting operation after receiving information of illegal activities within the reserve. That night, the rangers sighted lights in the reserve and found the vessel with the five males within the park. Hol Chan Marine Reserve Manager and Biologist Miguel Alamilla explained in court that the five “were suspected of spearing and fishing” in the reserve. When the vessel was caught, there was no fishery product with the five men. In court, Richard “Dickie” Bradley, Attorney for Kuhn, argued that the only evidence brought before the court were testimonies from the Fisheries Department gathered from the rangers working the night of the arrest at the reserve. He was able to successfully argue that there was no evidence to suggest the “suspicion” that the five were “spearing and fishing” as indicated. Because there was no other evidence other than the statements from the rangers, Magistrate Rodriguez found the five accused not guilty of charges and the men were allowed to walk free out of court. In a previous interview with The San Pedro Sun in August of 2012, Alamilla explained that there have been many reports that fishermen have been illegally fishing in the Hol Chan Marine Reserve. Because of the reports, Hol Chan Marine Reserve has increased their vigilance and conducts special operation to discourage the illegal practice.